I know what you're thinking, but unfortunately I do not have the 'Inside Scoop from Infinite Loop'. I do however enjoy the many benefits of VoIP. While I have been using Skype for a while, I never quite viewed it as a true VoIP phone, in the vane of VoIP providers like Vonage, OptimumVoice, and Broadvoice who actually provide me with something akin to a traditional phone experience. Skype was too IM-like for me to consider using. But then the lovely folks at Skype offered free calling to any phone in the US and Canada for free to the end of 2006. Since my phone calls at work are metered (we are only allowed a certain amount of long distance calls for non-business use per month), I starte using Skype to make long distance calls via the PC. And while it wasn't perfect, I was definitely impressed with the call clarity, and its ease of use. Although I didn't use them, Skype also had dirt-cheap rates for international calling. Still, as impressed as I was, I didn't look to skype as a full-time replacement for my VoIP phone - that is until last week. Last week Skype upped the ante in the VoIP wars - it began offering a full year of unlimited calls to the US and Canada for $29.95 (only $14.95 if you sign up before 12/31/06). In essence, Skype's annual rate is what its competitors charge monthly! While I was very intrigued by this, I knew that I couldn't sell skype to my wife without having a 'real' phone to call on. Since our VoIP phones offer low international rates, we actually use that as the only source to keep up with family and friends overseas. Thankfully, I discovered the CIT 300 - one of new Linksys's new iPhones (touche Apple!) that connects to your PC and landline (i.e. 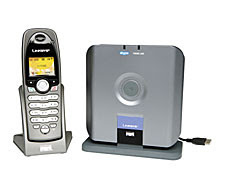 it's a two-line phone) so that you can choose to make calls either from Skype or your home phone. I also discovered that with a $10 Linksys Rebate and Google Checkout's $20 discount, I was able to get this phone for $50 (a lot cheaper than the current Wi-Fi skype phones which run about $150 on the street). For starters, the phone has several large drawbacks. First and formost, this phone is just like all of the other USB phones that one can use for Skype in that it requires you to interact with the existing Skype application to work. This means that your computer will always need to be turned on with Skype running and you being logged in. Essentially, the Skype phone is set up so that all of your audio for Skype calls is routed through the phone. This means that if you don't have the phone handy (or if someone else is using it for a landline call), you won't be able to answer a skype call with your PC. In addition, there is no way (that I have discovered yet) to make a call directly from your PC without dialing it from the handset. So if you are sitting at the computer and want to call someone, you need to initiate it from the phone first, or change your Audio settings. Another inherent issue with Skype is that it allows you to log in from multiple places at once. If someone tries to call you on Skype, and you are logged in at Work and at home, it will ring in both places, but whoever picks up first, wins. So if your CIT 300 is at home, and someone answers it while you are waiting for a work call, you won't be able to pick it up. It can also be annoying to have the phone ring at home even if they know not to pick up. 2 other pet peeves of mine about this phone - to dial a landline using Skype, you need to either prefix your number with 001 or a + sign, otherwise it won't go through. In addition, there is no way to bridge the gap between the landline and Skype - so if you want to make a three way call, you will need to do it with SkypeOut and not the landlines. Quirks aside, this is a good phone. All of my skype contacts come through to the handset for speed dialing (both Skype contacts and landlines that I have added to Skype as SkypeOut contacts), and the speaker phone is great. Call Quality is as good as your skype quality - i.e. it's not the phone's fault, and the backlit keys make it easy to dial in the dark. All told, this phone is a decent option if you want to use Skype for VoIP, but if you can afford it, you will get a little more flexibility with a Wi-Fi skype phone or Linksys' CIT-400 iPhone (which has skype built-in, and doesn't require your computer to be on to work). One more note, it seems that these Linksys phones allow for multiple handsets, but I have yet to find where they offer an individual handset for sale. However, since they just released some new products in the 'iPhone' line, it could be that those are not too far away.